NEW YORK (CNNMoney) -- Credit cards are making a comeback. At the end of 2008, more consumers were using debit cards than credit cards but now that trend has reversed, said Silvio Tavares, senior vice president at First Data, which processes card transactions for 4.1 million merchant locations. "Credit is back in favor," he said. "Consumers have spent the last couple of years de-leveraging and reducing credit card use, but during the past month -- and since April [of this year] -- they've been using their credit cards more and are starting to return to pre-recession buying habits." 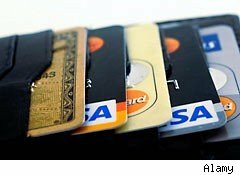 Purchases made with credit cards rose 8.2% in the first quarter of 2011, 9% in the second quarter and 10.6% in the third quarter, according to First Data. That compares with gains in debit card use of 9.6%, 8.3% and 5.9% for the same quarters. And a growing number of holiday shoppers are already opting for credit this year. Payments made with credit cards on Black Friday jumped 7.4% from the same day a year earlier, while debit card use only rose 3.4%. Are big banks really changing their ways?